Everyone has been incredibly helpful. The staff answered all my questions and followed up with me. The IT department walked me through everything I needed to know for the affiliate program. I would recommend [them] to anyone looking for an affordable insurance organization with a heart. I’ve used the [ordering process] multiple times, and it’s worked quite efficiently. THEY WERE PHENOMENAL!! They stayed in contact with [my hospital] the entire time that I was in the hospital and were in communication with the doctors. Also, they paid to upgrade both [my traveling partner] and I to business class on our return trip. When I returned I had several emails and a phone call asking how I was and making sure that we made it back. I highly recommend them!! Their customer service is fast and dependable. We have worked with various insurance providers, and Volunteer Card is by far the best. 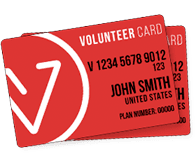 Volunteer Card offers an exceptional service and fast response times at an affordable price. Friendly, reliable and affordable. What more can you ask for?